A river catchment is an area with several, often inter-connected, water bodies (rivers, lakes, groundwater and coastal waters). Many of the problems facing our water environments are best understood and tackled at a catchment level. All our work will be planned and delivered in a way that takes account of the interconnected nature of the ecosystems working across and within river catchments. In this way we hope to be able to ensure our work is focussed in the right place and has the desired effect. It is a challenge to work in this way as it can mead difficult decisions have to be made as to what can be done and where, but we are confident it is the right approach and will lead to longer term improvements and sustained change in our local environment. The Department for Environment and Rural Affairs (DEFRA) have recognised the importance of working at a catchment scale and have established support for new groups of organisations to build catchment partnerships at a local level. 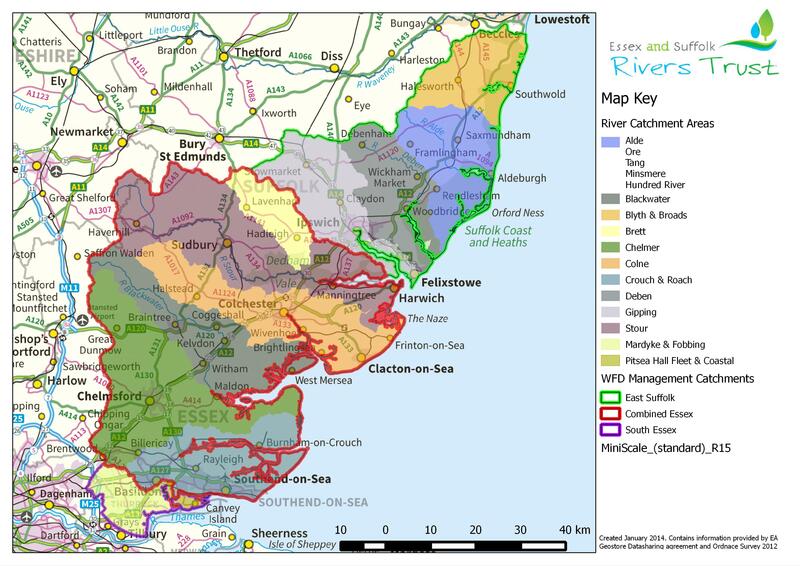 ESRT are proud to host the East Suffolk Catchments Partnership and be active partners in both the Combined Essex and South Essex Catchment Partnerships. The groups will operate across groups of river catchments (termed ‘Management Catchments’ by the Environment Agency. The three areas in Essex and Suffolk are shown in the map. “The water environment is affected by every activity that takes place on land as well as through our actions in abstracting, using and returning water to rivers, the sea and the ground. Catchments are the natural scale to consider this aspect of the environment.” Defra June 2013. “The Catchment Based Approach is a new approach being developed by Defra to improve the water environment through collaborative working at the catchment level. The aim for this approach is to balance environmental, economic and social demands and align funding and actions within river catchments to bring about long-term improvements.” Defra evaluation of the pilot catchments project.